John McCain and Barack Obama are doing all the right things. McCain, with unstoppable momentum and a good shot in his fundraising arm after New Hampshire, and Obama, with key endorsements that will translate into votes in Nevada, have their opponents grasping for some foothold that will give them resonance with primary voters. Hillary Clinton, with little to no endorsements in Nevada, is in the Silver State going door-to-door trying to steal votes from under Obama’s nose. “A day after the 60,000-member Culinary Union endorsed Illinois Sen. Barack Obama for president, Clinton walked a northeast Las Vegas neighborhood heavy with Culinary workers and won the support of several. This coming at a time when Clinton has done little but suffer in South Carolina. With the all but certain endorsement of Obama by Representative James E. Clyburn, a well-known and influential voice both for Democrats and African Americans, the Palmetto State has been a gathering of high praise for the Junior Senator from Illinois. John Kerry, now Clyburn. Just try to stop him. In the Republican theater, by all accounts, you have the GOP candidates literally holding back from attacking McCain. Campaigning, just like a spreading rumors, requires an understanding that if you are going to say something negative about someone else, you had better expect some blowback. Romney, Huckabee and Giuliani all know this and have stopped their hard-nosed attacks on the front runner in order to preserve the tenuous leads they might have over one another. Romney, on the other hand, is reeling. Getting little to no air time or free media in the past 24 hours has relegating him to second tier status after two ‘silver’ finishes in Iowa and New Hampshire. 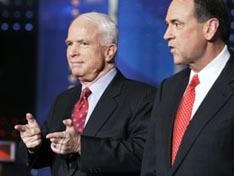 His only shot was at McCain at the debate and he played his hand somewhat effectively. Unfortunately for Mitt, he saw few other questions or opportunities come his way on the big stage. Barring a miracle, or more money from his personal fortune, I doubt the former Governor has the staying power to get him past anything other than first place finish in the next two primary states.